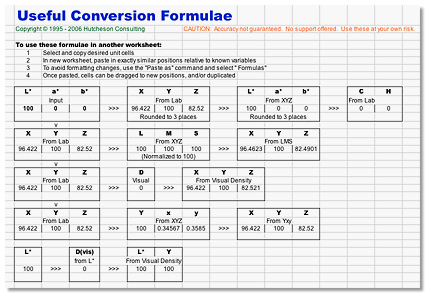 Some handy color conversion formulae derived primarily from "Measuring Color" by Robert Hunt. NO GUARANTEES OF ACCURACY - any errors are probably ours, not Hunt's. Buy the book if you want to be sure. Play with phosphor coordinates and visualize them on a CIEY,x,y diagram. 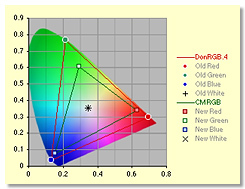 Compare the gamuts of different RGB working spaces. You will need some fluency in Microsoft Excel to use this. Added March 2006: "Ekta Space PS5, J. Holmes" (copyright 1998, Joseph Holmes, http://www.josephholmes.com). Follow the link for Joe's informative Read-Me and magnificent web gallery. 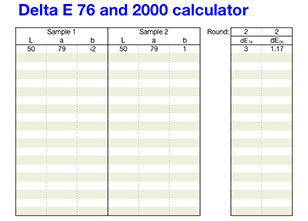 Simple spreadsheet for calculating the two most common versions of Delta E.